Unlike the rave review from yesterday, I don't really have nice things to say about this illuminating product. 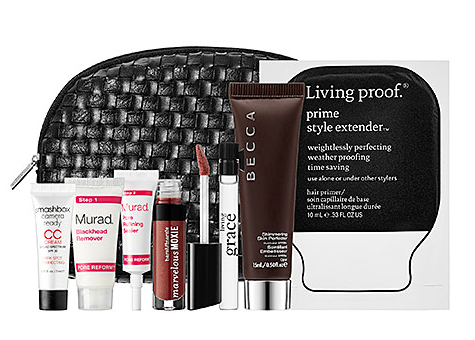 This is also from the deluxe sample bag from Sephora, and it is interesting that the Becca Shimmering Skin Perfector in Opal is the only thing that differs from the image from the site. I believe the brown tube is one of the Sephora perks and contains 15ml of the product where my beige tube comes with 10ml (which is still a generous amount). 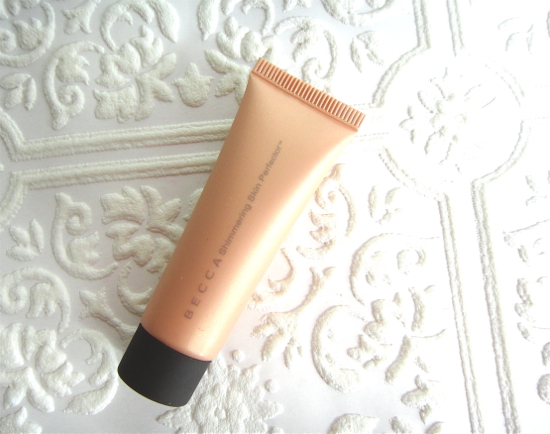 I have been hearing so many great things about this illuminator from Becca, so it played a big part for me to choose this very sample bag out of the four different kinds that were available at the time. I figured the Opal wouldn't be a perfect shade for my light and almost neutral complexion but I still wanted to experience it cause I have been on search for good primer/highlighter for some time. A sheer crème-liquid that perfects skin with light-reflecting pearls for a soft, natural glow. Achieve a subtle luminosity. This formula features ultrafine light-reflecting pearls that melt into your skin for polished, natural-looking radiance. Water-light and sheer, it has a prismatic effect that allows it to adjust in any light, so your refined glow is never lost. Opal is described as "Golden Opal Pearl". I would say this is a shimmery peach gold. The consistency is closer to creme than liquid and it spreads on evenly without streaking. My arm has more yellow than my face, but Opal is still too yellow and peachy against my skin tone. 3. To create all-over inner glow for face and body (mix with foundation or body moisturizer). Since the shade is not ideal for me to use as highlighter (I tried and it looked more like bronzer, and I must tell you that I have prettier ones than this if I wanted a bronzer. 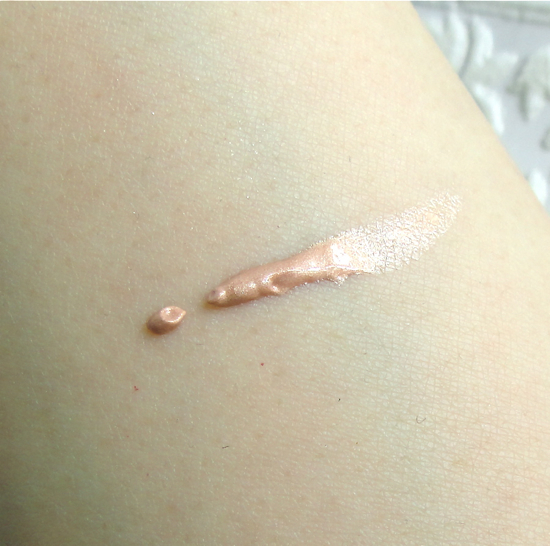 ), I mixed it with my palest foundation expecting it to add warmth and luminosity. Unfortunately and quite surprisingly, I did not see much difference at all! Did it make my foundation last on me longer? That was not the case, either. This is after I blended it in completely. The finish is quite subtle and satiny. I can only imagine this would be a subtle highlighter/bronzer on someone with medium complexion. To be honest, I don't think I would like this much even if I tried the lighter shades like Pearl or Moonstone. I am not so crazy about the fragrance that resembles Chanel Allure. I love the Chanel scent but all over my face? No, thank you. I guess I am looking for something more versatile maybe with hydrating benefits and lasting power. 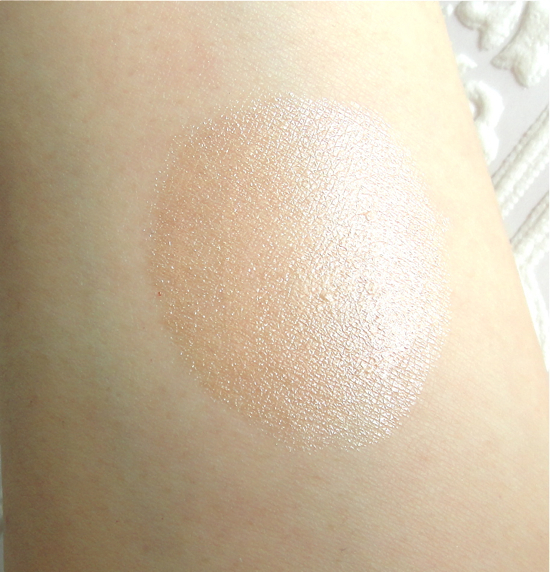 Becca Shimmering Skin Perfector is too pricey just to be used as a spot highlighter (or bronzer). 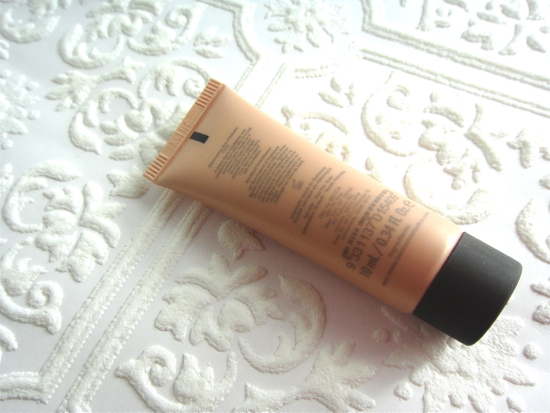 There are tons of great foundation with luminous finish and highlighters with more interesting colors. I mean I find Benefit Highbeam more complex, for example. I would rather invest on Giorgio Armani Fluid Sheer (07) or opt out for Rouge Bunny Rouge Highlighting Liquid (Sea of Tranquility 008). Since I am feeling grumpy about this product, let me add this, too. You might say "oh, but this comes with sun protection. ", right? Sorry to break your bubble, but in reality, it is as if there is no protection. First of all, avobenzone (used in this) is an extremely unstable sunscreen agent and it is not ideal to be mixed with titanium dioxide or mica (which are abundant in the Shimmering Skin Perfector). More importantly, you have to use at least 1ml for the entire face to get any promised protection (whether it's SPF 15 or SPF 55), but there is no way you can put that much of this on your face. Period. You can bust out your measuring spoon and test it if you don't believe me. The 1/4 tbs is equal to 1.25ml. So fill that tiny spoon with your favorite sunscreen (or Becca Shimmering Skin Perfector in this case) - maybe a little less since you only need 1ml, then put it on your face. You will be shocked to find out it is actually a lot (I repeat. It is A LOT. ), and you will most likely end up looking like either a grease ball or a disco ball.